He contends that energy input prices have fallen in recent years, and the advent of new technologies should be generating productivity gains. However, prices have been driven up by the legacy costs of de-carbonisation, which now account for 20% of energy bills and will collectively reach £100 billion by 2030. He goes on to point out that in the past decade, the Government has moved from a primarily market-driven approach to one where almost all new electricity investments are determined directly by the state, with the results being vulnerable to lobbying and based on often flawed price modelling. Helm also criticised the focus on the electricity sector rather than agriculture, buildings and transport, pointing out that agriculture is responsible for 10% of greenhouse gas emissions but only 0.7% of GDP, with at least half of its output being uneconomic as a result of subsidies. harmonisation of carbon prices and energy taxes. Helm is of the view that there have been too many interventions in the energy markets, adding significant costs. He lists the set of current policy interventions over 4 pages in his report. On top of this many different bodies have the right to intervene in energy markets and multiple initiatives. Helm cites energy efficiency as an example where a dozen or more major initiatives aim to deliver a wide range of efficiency objectives. The government should carry out a comprehensive review of statistical, scenario and forecasting activities in BEIS. The assumptions have consistently been based on a mistaken belief that fossil fuel prices would continue to rise. 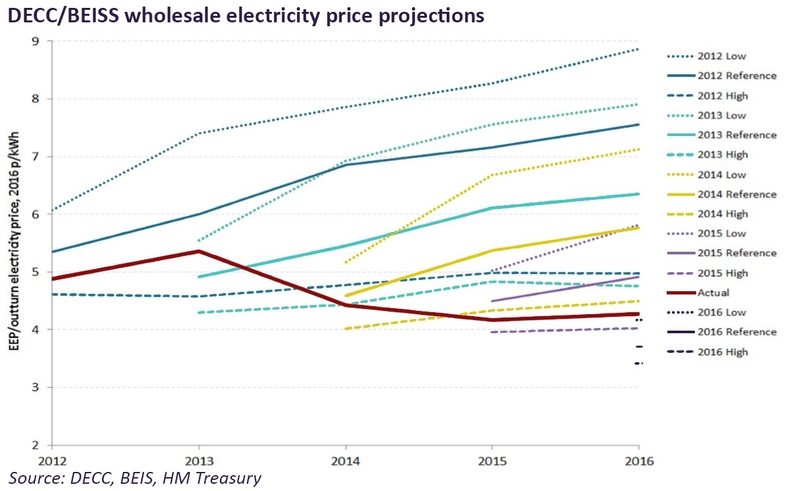 Had assumptions of falling wholesale prices been used, then different policy decisions may have been made, leading to lower energy costs. Helm also makes an interesting point about the need for forecasts – in a competitive market, prices are the outcomes of the competitive process whereas the absence of markets leads to the need to generate forecasts, for example where forward curves are too short to allow for long-term decision making. He argues that a more market-based approach reduces the need for direct intervention, and hence the need for forecasts, and suggests that prices should be revealed through auctions of capacity and de-carbonising investments through a single unified equivalent firm power (“EFP”) auction. He then goes on to describe why the markets have failed to deliver the investment signals necessary to sustain security of supply which led to the creation of the capacity market. In a well-functioning competitive market, the difference between the system marginal price (“SMP”) of electricity and a generator’s short-run marginal cost (“SMRC”) would deliver the returns required to recover investment costs and deliver an adequate return on capital for investors. However, the market would only deliver the required capacity through this mechanism – additional capacity buffers needed to guarantee security of supply would not be rewarded and therefore would not be built. In addition, as increasing amounts of zero-marginal cost generation such as wind and solar is added to the system, the SMP becomes lower than it would otherwise be. As this type of generation would not be incentivised through the normal market mechanisms, it has been subsidised, and as this generation is also intermittent, it becomes harder for the market to determine the appropriate level of capacity since the utilisation patterns of traditional forms of generation change and become less predictable. Policy actions to incentivise security of supply lead to excess capacity being added to the system, further reducing the SMP, and hence the number of new generation investments that could expect to yield positive returns. As it turns out the market delivered almost no new thermal units forcing the introduction of the capacity market. It is the job of National Grid, as system operator, to balance these forces in real time. Historically, a “command and control” approach was taken, and in a highly centralised system with low intermittency and low flexibility, that approach made sense. However, in addition to the changes in generation, the demand side has also seen significant change, with increased flexibility through a combination of new technologies (storage, embedded generation, “smart capabilities”…) and new behaviours (load-shifting, turn-up/turn-down DSR…), which suggests a different approach where generators suffer penalties for failure to deliver apply. A market where all generators bid for firm power contracts would place the costs of intermittency on the generators that create it, rather than on consumers collectively, leading to a market price that is more reflective of the true costs of delivering electricity in all periods. Emergency standby capacity would still be needed, but by setting appropriate penalties for non-delivery, providers of intermittent generation will be strongly incentivised to develop flexibility contracts and invest directly in back-up technologies. Helm argues that such a mechanism could replace FiTs and low carbon CfDs because the emerging market prices would deliver investment signals that are properly cost-reflective, allowing efficient allocation of resources. Alongside this would sit more effective carbon pricing (see below). Helm believes that this approach would lead to lower energy costs not only because the current system is inefficient, but also because the FiT and CfD schemes are poorly structured and cost more than they should. The benefits of this approach would include establishing via the market the full costs of subsidies; incentivising the secondary markets in flexibility, back-up supplies, storage, and other ways to manage the intermittency as part of the broader energy-only wholesale market; cutting away the “picking winners” elements and associated lobbying and capture; and radically reducing and simplifying the multiple policy interventions and regulations. Helm’s optimal solution is a proper cost of carbon and an auction system, which merges the capacity market and the FiTs on a common EFP capacity basis, with the wholesale market and CfDs and other contract forms addressing non-firm energy through bilateral voluntary arrangements. Integrating the FiTs and low-carbon CfDs into the capacity markets, and making all technologies bid on an EFP basis would mean generators that create intermittency must pay the costs of intermittency in the same way that a carbon price makes those that emit carbon responsible for the carbon costs they cause. In EFP capacity auctions, each type of generator would be allocated am EFP de-rating factor between 0 and 1 indicating its expected contribution to security of supply in all periods where there is not enough, or only just enough, capacity to meet demand. Intermittent generation would achieve de-rating factors below their average availabilities, because at some times it will have zero availability. By investing in storage or developing other means of raising their availability, intermittent generators would be able to achieve higher de-rating factors. There would be some challenges relating to the participation of storage directly in the auctions due to their short durations, but these issues affect the existing capacity market and need to be resolved in some way in any case, probably through a lowering of their de-rating factors. A combination of cost-reflective carbon pricing and EFP auctions would simplify the electricity market considerably, allowing the Government to withdraw many current policy interventions. However, as Helm acknowledges, exposing the true costs of renewable generation may be politically difficult. Helm is critical of the current price control framework for network operators, which has proved to be overly generous to network operators, and which is set to run to 2021 and 2023. There are no existing mechanisms within RIIO for correcting the cost inflation that have arisen through forecasting errors, meaning the prices faced by consumers remain higher than necessary. Helm believes Ofgem should explicitly address this either by signalling to network operators that excess profits in this period will be recovered in the next period, by using the threat of other interventions to incentivise network operators to set prices below the allowable levels, or by engineering a significant interim review that would formally adjust revenue allowances. In the long run, Helm opposes the practice of periodic price reviews on the basis that the future is fundamentally uncertain and that technological progress is both occurring quickly and blurring the traditional distinctions between transmission and distribution on the one hand, and generation and supply on the other. The periodic reviews assume there is a distinct and separate activity called “networks”, which is increasingly untenable, since the need for network reinforcement or expansion may be addressed through local generation, storage, demand side response or other, non-traditional approaches. Helm suggests that all the activities of DNOs could theoretically be put out to tender, inviting other companies to bid for the operations, maintenance, and enhancements of networks, leading to a market-based replacement for the RIIO framework. Helm advocates the creation of a National System Operator (“NSO”) and Regional System Operator (“RSO”) scheme where some of the transmission and distribution licence obligations are transferred from National Grid and the DNOs to the NSO and the RSOs, particularly in relation to security of supply. The NSO and DSOs would determine what operations, maintenance and enhancements to the networks are required and be responsible for ensuring their delivery, potentially by putting them out to tender. The NSO and RSOs would not own assets – their role would be in conducting auctions and co-ordinating the markets. Such a structure would have the benefit of simplifying the regulatory landscape – the licencing regime could be streamlined, and various functions carried out by Ofgem would transfer to the NSO and RSOs, to the point that Ofgem’s role would be significantly scale back. To avoid conflicts of interest, Helm argues that the NSO and DSOs should be independent of National Grid or any existing DSOs/DNOs, and should be public bodies, accountable to BEIS, Parliamentary Select Committees, and subject to scrutiny by the National Audit Office. Technological change is radically altering the cost base of the electricity network, which Helm believes will lead to a fall in the proportion of system costs that are variable (he does not explain how this would happen). Helm points out that the shift towards fixed costs means that switching will to apply to an increasingly narrow section of the cost base – it is certainly the case that the falling proportion of costs that are under the control of suppliers leads to lower competition, whether this has anything to do with a change in the nature of the external system costs is less clear. Helm sees a world where competition will focus on capacity and capacity packages, defined on the basis of maximum volumes, similar to the current broadband and mobile pricing packages. In this world, energy is a means to an end rather than an end in itself, in the same way that fixed telephone lines are largely bundled in a wider package of media services rather than provided on a standalone basis as the primary service. Charge according to the economic efficiency criterion set out by Ramsey – Ramsey pricing allocates fixed costs inversely to the demand elasticity, with a view to recovering costs with minimal efficiency distortions. Recover on a purely volume-of-consumption basis – the problem with this approach is that it confuses the price of capacity and systems with the marginal incentives to consume extra units of energy. Recover the costs through a fixed charge, like a standing charge – a capacity or access charge. Charge according to ability to pay – this option allows fuel poverty to be taken into account and could apply a discount to the poorest customers, or as a rising block tariff as volumes rise increasing the price as the consumption goes up. Use industrial policy – this could explicitly apply short-run marginal cost pricing to large industrial companies, and the average costs to the rest of the customer base. Charge an initial minimum block, followed by demand-related charges. Option 4, cost recovery based on the ability to pay (but without the consumption linkage) would fit well with recovering system costs through general taxation rather than energy bills. The locational costs of intermittency also need to be taken into account – the proposed EFP capacity auctions deal with the intermittency in delivering capacity, but do not address the costs to networks of intermittency and location which would require nodal pricing. New smart technologies provide opportunities for locational pricing, possibly with the use of auctions substituting generation, storage or demand-side in place of network expansion or reinforcement. As part of the DNO to DSO transition, some distribution companies are already exploring such schemes. Helm sees a role for the NSO and RSOs in this area. The section on supply costs merits more detailed analysis, which I will do in another post, however they key arguments made by Helm in relation to supply follow on from the conclusions of the Competition & Markets Authority investigation of energy markets, which identified a £1.4 billion domestic customer detriment due to the pricing policies of energy suppliers (in particular the Big 6). 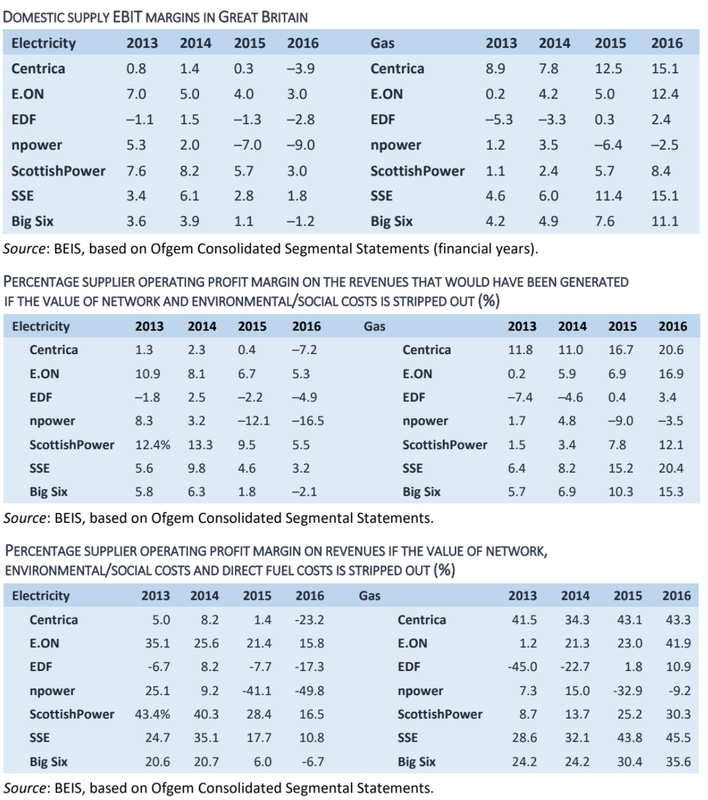 Helm broadly accepts these conclusions, and compared the margins earned by the Big 6 as quoted in their Consolidated Segmental Statements, and the margins excluding the impact of network and environmental costs which are outside their control. He also looked at margins excluding direct fuel costs, as these are also, broadly speaking, outside the control of the suppliers (hedging costs tend to be accounted for separately). I am inclined to agree with Helm’s assertion that the margins being earned by the Big 6 once the pass-through effects of external costs are removed, have historically been on the high side, although it should be noted that they also display significant variability across the companies. While overall trends appear to be consistent across the group, the absolute levels vary considerably. The question that follows from this, is what level of margin would be considered acceptable: how much is too much? And then, what should be done if margins are indeed higher than can reasonably be justified. Helm makes no real attempt to answer the first question. He refers to the regulated margin in Northern Ireland as a possible benchmark, but there is no detailed analysis on what would be a fair margin in the UK context. In 2016, half of the Big 6 had negative margins on their domestic electricity business, and of those that were profitable, the highest margin on a controllable costs basis was 17.3%, which doesn’t seem to be scandalously high. While overall margins may not be excessive, this does not mean that some consumers are not overpaying. The CMA and Government are concerned that so-called “inactive” consumers, ie those who do not switch suppliers for whatever reason, are exploited by suppliers, who over-charge these customers in order to provide discounts to more active consumers. This cross-subsidisation is not visible in the CSS data since there is insufficient granularity, but it is reasonable to suppose that suppliers are behaving in this way since this is a rational course of action to take in a competitive market. The Government is legitimately concerned that vulnerable consumers significantly overlap with inactive customers, making this type of cross-subsidisation undesirable for reasons of social justice. providing full transparency through a default tariff, either as a version of a comprehensive SVT price cap, or instead. The third option is Helm’s preferred solution, where the focus is on margins, and the costs the suppliers actually control. The default tariff (whether called “SVT” or not) would incorporate all the costs of energy as set out in the review, with generation costs being indexed to wholesale prices, and with some margins allowed for the risks associated with collecting system costs through bills. Margins would be transparent and published on Ofgem’s website, and could be capped to protect vulnerable customers. In addition to the costs of generation, capacity, FiTs, CfDs, transmission, distribution and supply, a complex suite of energy taxes, carbon prices, and other levies are applied to energy consumers. Aside from general revenue-raising objectives, taxes are used to correct market failures, the most important of which (in the context of current Government policy) is carbon. Helm argues that a carbon price is the most efficient way of achieving carbon reduction objectives. 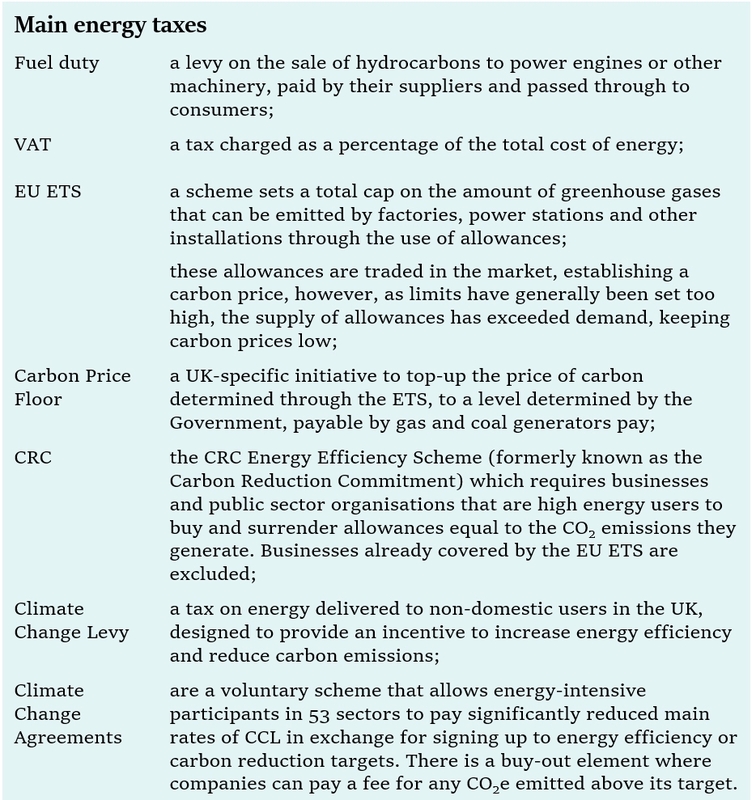 Helm describes seven main taxes on energy and carbon, depending on how taxation is defined, some of which are “mind-numbing” in complexity, and most of which are characterised by various exemptions or discounts, particularly for energy intensive industries. Ideally, any tax scheme should have as few exemptions as possible. The current UK energy taxes will need to be reformed as changes in technology (for example EVs which will erode fuel duties) accelerate. Helm asserts that the case for harmonisation and universalisation of the carbon price is overwhelming, since a uniform carbon price would provide common incentives across the economy incorporating agriculture, buildings, transport and other sectors and allow the market to find the least-cost solutions. It would facilitate the abolition of the other tax measures and raise revenues lost as income from fuel duty falls. According to Helm, there are two ways of approaching carbon price and energy tax harmonisation: through a generalisation of fuel duty; or with the CPF and CPS. Fuel duty could be extended to include coal, oil and gas used throughout the economy, moving the focus from roads and vehicles to general tax. An alternative would be to generalise the carbon price floor and price support to include all sectors in the economy, not just power. Helm advocates a “polluter pays” philosophy, citing farmers releasing carbon from soils, drivers of petrol and diesel vehicles, and industry and power stations as needing to pay the social cost of carbon. He believes the markets should determine the cheapest ways of reducing carbon. Some carbon intensive industries are important for other societal reasons: manufacturing creates jobs and exports which benefit the wider economy (and the closure of these industries in the UK does not mean global pollution would fall since production would simply move elsewhere, and possibly to countries with weaker environmental codes). Agriculture, identified by Helm as a very carbon inefficient sector, contributing far more to carbon emissions than it does to GDP, is also important for food production, and it is not clear that importing more food would have a lower carbon cost. As a tax, “polluter pays” is regressive, having a greater impact on those who are less able to pay and less able to reduce consumption through investments in efficiency measures. On the other hand, requiring producers of intermittent generation to pay the system costs of the intermittency they create does not have the same negative effects. In addition to taxes and levies, there have been other interventions to regulate emissions directly, such as the Industrial Emissions Directive to limit emissions from large combustion plants. Helm describes these as second-best approaches, but concedes there can be benefits, for example the banning of petrol and diesel only cars by 2040 should incentivise the creation of EV charging infrastructure. He attributes significant value to such interventions in terms of policy certainty, and suggests the Government goes further to confirm the coal phase out and petrol/diesel car phase out through legislation to reduce the risk of reversal by future governments. On top of these measures are further initiatives that impose costs on consumers, primarily relating to energy efficiency and the smart meter roll-out: suppliers face obligations to implement energy efficiency measure for consumers and install smart meters, the costs of which are recovered from their customers. Helm identifies a problem with some of these schemes, (in addition to the general increase in complexity) where the costs are recovered from all customers while the benefits are only felt by those that participate in the schemes. He believes, and it is hard to disagree, that those who benefit from such measures should pay for them, and that wealth re-distribution should be separate from energy policy. All of the above gives rise to industrial competitiveness challenges, where UK-based sectors find themselves at a disadvantage internationally due to higher energy input costs. This can be addressed through various exemptions, as is currently the case, or by imposing a carbon price at the border. A border carbon price would in theory be the cleanest approach, however, this may present issues in relation to wider trade policy particularly in the context of Brexit. Helm argues that if exemptions are the preferred route, the landscape can be radically simplified, and that industry should be exempted from all the legacy costs of renewable subsidies, which would either fall exclusively on the domestic sector, or be securitised and socialised by the government. These legacy costs arise from existing subsidies for renewable and nuclear power which overhang the market and distort final electricity costs and prices to households and businesses. They are analogous to legacy out-of-the-market banking contracts following the financial crisis in 2007/08. Helm recommends that these out-of-the-market elements of the ROCs, FiTs and low-carbon CfDs should be transferred into a new legacy bank. Greg Clarke has said that he engaged Dieter Helm to ask difficult questions about the issues that lead to energy price formation, and in his review he has done just that. Some of his conclusions are hardly radical: the complexity of the market is already acknowledged and inevitably adds costs, but other ideas are more interesting. In particular, his belief that generators who add to the intermittency of the electricity system should pay for the associated costs is likely to prove controversial, but that does not mean the idea lacks merit. On the contrary, this step would go some way to levelling the generation playing field. His ideas in relation to carbon pricing are less appealing. Setting a border price for carbon seems unrealistic, and it is hard to see how a uniform carbon tax could be applied without damaging competitiveness. Avoiding this would mean various exemptions which moves back towards the levels of complexity his ideas are designed to minimise. His proposal to create a NSO and various RSOs as publicly owned bodies is also likely to be controversial. The Labour Party currently favours re-nationalisation of the energy industry, but the Government prefers private ownership. It is unclear why public ownership is necessary – separation of the system operation activities from ownership of system assets should serve to remove conflicts of interest. This could be achieved by making the system operators independent, while remaining in private ownership. However, in the short-term at least, the most attention is likely to fall on his ideas around energy supply and the creation of a regulated default tariff. The idea of capping the margins suppliers earn on the default tariff has merit as it would allow a degree of consumer protection while avoiding the pitfalls of outright price caps. However, he could have gone much further in suggesting how electricity pricing could be reformed to make it more transparent and generally fairer for consumers. A big criticism of the review is that, despite its length, there is little detail around how the various measures could be implemented. Although he acknowledges some of the challenges around setting appropriate auction targets and so on, he could have gone further in proposing more detailed design frameworks. As a result, there is a risk that the review will end up being an interesting side-show rather than the catalyst for meaningful reform of the sector. BEIS intends to issue a call for evidence to gather industry views on the Helm review and recommendations – it will be interesting to see how these are received once people have had time to properly digest the report.